There are lots of ways to keep your kitchen organized and surfing online, you can never ran out of countless possibilities. Adding more storage spaces in the kitchen can really do the trick. Not only will it make your kitchen clutter free, it can also make your kitchen looking elegant, organized and professional. One of the basic things that we need to look into when it comes to organizing is the kitchen cabinets. It needs to have pull out shelves, drawer organizers, spice rack, lazy susan, door storage, towel holders and more. It really pays to save on space as this will help you create more seating areas or just simply make your entire dining room and kitchen look spacious. There's nothing compared to a spacious, well ventilated but fully functional kitchen. In need of ideas to incorporate in your already existing kitchen? That's not really a problem, you may want to visit www.ovisonline.com. 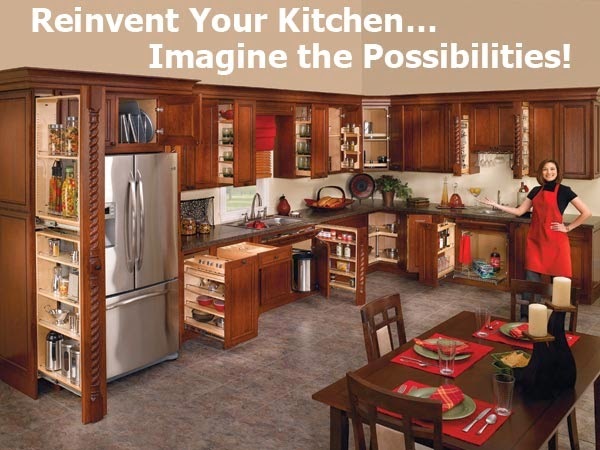 They have these kitchen make over ideas and a variety of products to suit your needs. You will surely love their selection of cabinet organizers and their featured decorative hardware. Every Mom deserves a nice and beautiful kitchen. After all, it's the most used part of the house and where delightful meals are prepared for our loved ones.